At the turn of the last century in Russia, the Imperial Cabinet acquired monumental silver vessels for presentation during diplomatic visits or to mark important events. 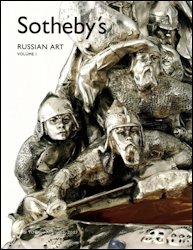 A series of bogatyr kovshes depicting heroic warriors in various poses was discussed in the Fabergé Research Newsletter, Winter 2015. These compositions were chosen as gifts from the State as they conveyed dramatic impact and implicit messages of “Russianness” to the recipient. They also showcased the mastery of the most accomplished palace purveyors. Sometimes in these silver compositions, a figure seems to emerge from a writhing mass of bodies clinging to a rudder or to the sides of a sea-going vessel. There is an impression of movement and straining as a fixed point on the horizon is spotted and the warriors prepare themselves for what is ahead. The magnificently sculpted pieces certainly convey power and impact. The question remains, how individual or unique where they? Fabergé Moscow excelled at producing large scale kovshes in the Russian taste using the lost-wax method: A plaster mold is created from a wax model which is melted away as heated silver is poured into the form. The technique limits the original wax model to individual use and therefore, the costs associated with such a commission could not be defrayed by creating a series which might benefit from the economies of scale. 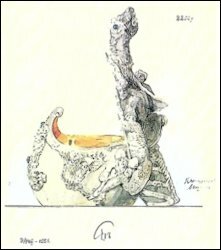 It is likely the bogatyr series discussed earlier were conceived individually and additional close study could reveal further insight into Fabergé’s production. A kovsh dated 1899-1908 is now in the Maxim Revyakin Collection in Moscow. It was recently published in a lavishly illustrated tome, Feodor Rückert and Fabergé (2016) detailing the personal collection of the new owner with text by Tatiana Muntian. Originally in the Forbes Collection in New York, the kovsh was sold at auction (Sotheby’s New York, April 16, 2007, Lot 24). In this example, our eye is drawn to the vertical handle formed of bogatyr figures in high relief. The men, drawn possibly from the Tale of the Armament of Igor (the account of a failed raid in 1185 by this Prince of the Rurik Dynasty against the Polovtsians of the Don River region) are grouped more vertically against the stylized totem pole draped with a flag and appear to surge over the rear rim of the vessel. 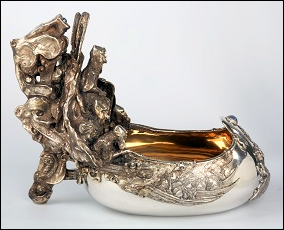 The prow is marked by an absence of ornament apart from chased scrolls in the Art Nouveau taste set at wide intervals, and is applied with a small Imperial Eagle, seeming oddly proportioned and placed between boldly repoussé shapes. The scratch inventory number 21843 may confirm its imperial links but at present, there is no evidence of why it was made or for whom. The Revyakin kovsh has been compared to a pencil and watercolor drawing now on display in the recently opened Carl Fabergé Memorial Rooms in the General Staff Building of the State Hermitage Museum. When the drawing was published in von Habsburg and Lopato’s Fabergé Imperial Jeweler (1993), p. 415, it was inscribed for 2,200 rubles and the Cyrillic inventory notation E/RO III-1591. In later publications, von Habsburg, Fabergé Craftsman and His World (2000), p. 121, and the recent Revyakin book (p. 92), the price notation does not appear. The drawing has also been linked with another monumental kovsh depicting warriors clustered around a prominent rudder and is preserved in the Olympic Museum at Lausanne, Switzerland. 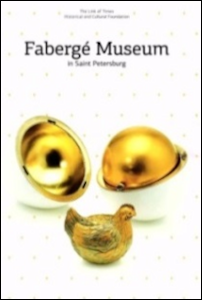 (Fabergé Research Newsletter, Summer 2015) It shares the bogatyr theme, gilt interior, and cabochon-set stones of its companion but seems to challenge the idea that official gifts were simply pulled from palace storerooms where they were stored while awaiting “assignment”. 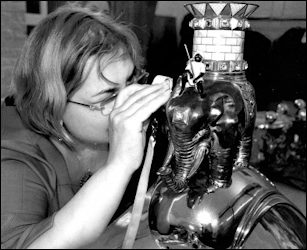 In anticipation of the 1912 Olympics, St. Petersburg jewelers were invited to compete for a trophy to be created in the form of a traditional Russian drinking vessel. 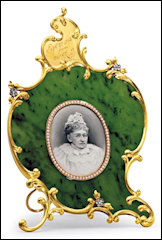 Larissa Zavadskaya in her article, “Design Drawings of C. E. Bolin’s Items of Jewelry in The Hermitage” in Jewellery & Silver for Tsars, Queens and Others. W. A. Bolin 200 Years, 1996, 219-223, notes Bolin’s entry was turned down in favor of Fabergé’s which was approved for the Olympic kovsh. It appears various drawings preserved in the Hermitage Museum for kovshes and tankards decorated with epic heroes may relate to this competition. 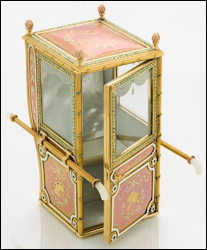 It is certainly true the Imperial Cabinet purchased stock from Fabergé and other prominent makers in large quantities, particularly in preparation for extended official tours and lavish gifting abroad. However if, as has recently been stated in the Revyakin text (p.95), the Hermitage drawing now displayed in the General Staff Building was submitted for inspection to the office of His Imperial Majesty as the proposed Stockholm Olympic prize of 1912, then certain monumental kovshes were specially conceived for particular presentations. The Olympic kovsh was reviewed once again to find links between the composition and the specific event for which it was created. The object features a prominent Bogatyr figure in chainmail, this time leaning forward against his shield as he surveys the horizon surrounded by his men. The sizeable handle enriched with scrolling motifs suggests swirling wind or surging seas surrounding a rudder. The totemic support for the principle figure is replaced by a clutch of oars and the prow features galloping horses. The iconography does not seem to relate to the events comprising the decathlon of various races, hurdles, jumping, shot put, javelin, discus and pole vaulting. None of these categories required the use of a boat or equestrian elements depicted in the prize’s sculptural relief. On April 6, 1911, the General Staff Headquarters in St. Petersburg acknowledged correspondence from Count von Rosen (a prominent Swedish sportsman and campaigner for equestrian events), and the agreement of the Swedish Ministry of Foreign Affairs to allow Russian officers to participate in the 1912 Olympic Games. 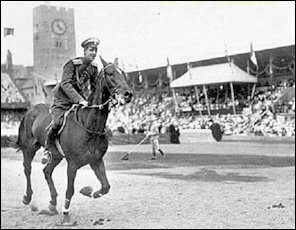 The agreement to permit officers to be seconded to the games would have been important for Russia as it, in effect, permitted some of the Empire’s most elite horsemen and highly trained athletes to participate. It is interesting to note that Grand Duke Dmitri Pavlovich of Russia, grandson of Alexander II and cousin to Nicholas II, was a guard’s officer chosen to ride for Russia in the 1912 Olympics. Certainly there were other noblemen highly trained in various disciplines who could qualify as amateur sportsmen whilst benefitting from a lifetime of preparation for such a competition. 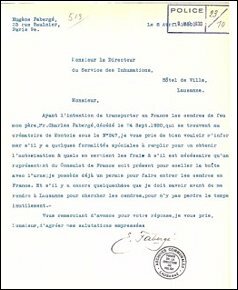 On May 4,1911, the Russian office responsible for administering the Imperial Household (Ministry of the Imperial Household Office) reported Baron de Coubertin inquired, on behalf of the Prince of Sweden, as to His Imperial Majesty’s intentions to grant a challenge cup. The Ministry of the Imperial Court submitted the choice of award to Nicholas II for approval. On June 9th, the Imperial Cabinet documented that it pleased the Emperor to choose a kovsh formed as a boat with the State coat of arms and warrior figures, stock number 533 for 2,500 rubles. Recalling the Hermitage drawing originally marked for 2,200 rubles, the discrepancy with the figure noted by the Imperial Cabinet of 2,500 rubles throws further doubt on the drawing being the approved design for the Olympic kovsh. This does not preclude that the kovsh was a special commission, only at this time the object’s full background is not known. We may not understand the Fabergé process from conception to delivery of the Revyakin or Olympic kovshes, but recent publication and archival revelations certainly contribute to our understanding of the Fabergé era. While the lands of European Russia have been populated since before the Ice Age, it was the arrival of the Vikings (Varangians/Norsemen) that began the coalescing of the tribal peoples into what was to be considered the first ‘Russian State’ or Kievan Rus. Its first leader of legend was Rurik, a Jutlander who made his way to Russia raiding through the British Isles and across Europe. Building a fort at Ladoga, he controlled access to Kiev, the key to the south with its access to the Dnieper river system flowing to the Black Sea. At the mention of Carl Fabergé, the most universally familiar of his works appear to be inspired by the style of the arts in St. Petersburg, influenced by European tastes as observed from Peter the Great’s ‘window on the West’. The workshops of the Moscow Branch, however, maintained a deep and strong connection to the style of ancient medieval underpinnings. Alexander III, while still Tsesarevich, visited Paris with his father and there encountered the works of Russian artist, Viktor Vasnetsov (1848-1926). Alexander insisted on purchasing Vasnetsov’s Acrobats for his personal collection. At the 1882 Moscow Pan-Russian Exhibition, Carl Fabergé was awarded the gold medal and St. Stanislas for his replica of a 4th century gold Scythian bangle, and in 1885 was named ‘Supplier to the Court’ by then Emperor Alexander III. The works of the two artists – Vasnetsov and Fabergé – were to converge in the ‘Russification’ of Alexander’s focus on the Decorative Arts. Vasnetsov was chosen to produce the art for Alexander’s 1883 Coronation Menu, featuring the bogatyr theme. The artist alludes to the subject of his future monumental work with the positioning of the three distinctive warrior helmets at the top of the menu. 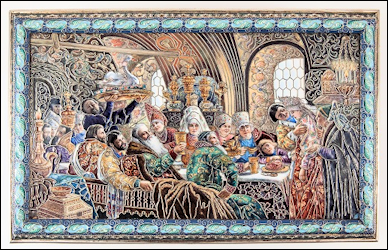 This menu commission continued in 1896 at the ‘Tsar’s Repast’ following the coronation of Nicholas II where, at each place setting lay a rolled copy of the painted menu created by Vasnetsov, tied with a tasseled, golden chord. 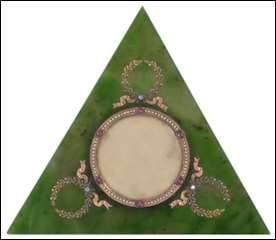 Such objects often reflected designs based on Byzantine ornamentation, taken from early illuminated manuscripts, ecclesiastical objects, folklore, and bylina (Russian epic songs) beautifully expressed by workmasters using techniques including: cloisonné, enamel, and en plein. This Byzantine influence traces back to early Kievan Rus when, the Vikings quite literally ‘navigated’ themselves into Russia. In part, their goal was to gain better access to the riches of Constantinople. This essay offered me an opportunity to study in detail a silver-gilt box, a personal favorite of Artie McFerrin, from the larger McFerrin Collection on view at the Houston Museum of Natural Science. Mr. McFerrin expresses his love for Rückert boxes: “They are true history, telling a story or folklore of Russia passed down through culture and art.” He further appreciates these images represent culture and historical events through the eyes of the painters. The detailed description of the McFerrin piece reads: Russian silver-gilt box, shaded cloisonné and en plein enamel casket, made by Feodor Rückert (a supplier to Fabergé), Moscow ca. 1896-1908 with scratched inventory number 20409. 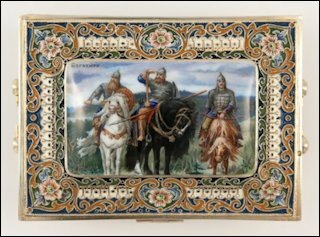 Rectangular, the hinged cover centering an en plein enamel plaque depicting three of the most famous bogatyrs, Dobrynya Nikitich, Ilya Muromets, and Alyosha Popovich, as in Viktor Vasnetsov’s 1898 painting Three Bogatyrs. 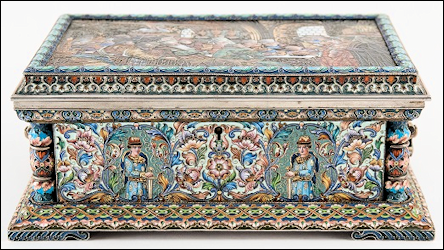 Enameled overall with floral and scrolling motifs on cream white ground, the interior of the lid with blue translucent counter enamel, gilt interior, dimensions 2 x 4½ x 3 1/8 inches. 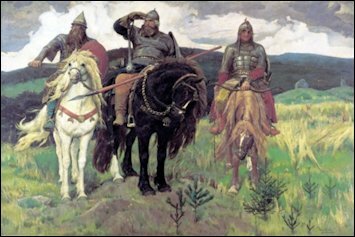 Vasnetsov’s children recalled that The Bogatyrs painting followed them from city to city, from apartment to apartment. Sketched images of his vision were first put to paper in 1871. Thus, the gargantuan 9.7 x 14.6 feet (295.5 x 446 centimeter) composition was begun in the reign of Emperor Alexander II, developed during the reign of Alexander III, and was at last hung in 1898 at the Tretyakov State Gallery, Moscow during the reign of Emperor Nicholas II. Vasnetsov labored through the reigns of three emperors to bring his canvas Three Bogatyrs to fulfillment. 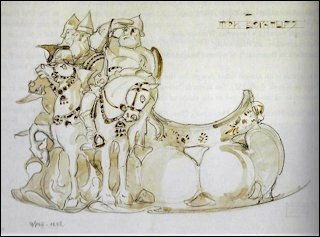 A Fabergé sketch for a silver kovsh, (whereabouts unknown), is rendered in the Old Russian style and most certainly modeled on Vasnetsov’s painting. I like to envision an artist from the Fabergé firm on a visit to the Tretyakov Gallery experiencing the impact of this monumental work just as I did. Although the individual bogatyrs are situated in a variant order on the sketch, their individuality can be readily discerned. The Three Bogatyrs are named: Dobrynya Nikitich, Ilya Muromets, and Alyosha Popovich. Some illumination of them as individuals brings further appreciation of the box and its stylistic and historically encoded message. Russian researchers concluded Vasnetsov’s Three Bogatyrs were actual historical personalities. They emerged as valiant ‘Defenders of the Russian Lands’ against the Varyags (Vikings), Pechenegs (Turkic tribes of the Central Asian steppes), and Polovtsians (Cumans – tribes from North of the Black Sea & along the Volga). In Vasnetsov’s painting, Dobrinya Nikitich is on the left: His expression is alert, his shield is up, his sword is being drawn; he is battle-wise and born to conquer. Even the head of his billowing white steed is raised in challenge, with nostrils flared into the winds of any oncoming siege by natural phenomenon or human malice. Who is this ancient warrior who, while not occupying the commanding position in the painting, nevertheless is the catalyst to victory? Perusal of facts and allusions set forth by the researcher/writer in the USSR article “The Bogayrs”1 reveal fascinating substantiation as to this pivotal Hero, as the uncle of Vladimir, and so stood closest to the ‘Throne of Russia’. Iliya Murometz dominates the central position in Vasnetsov’s masterpiece. His powerful presence bulges from the canvas. Shading his eyes, he surveys the vast Russian horizon for insurgents, his felt-booted foot confidently withdrawn from the stirrup iron. Aliosha, to his left, stares almost blankly, a bow resting on this horse’s lowered neck. All await the incontestable order and edict of Murometz, this hero who performed his feats at the court of Vladimir I, ‘The Red Sun’. The epithet accurately translates as ‘The Fair’ from the ‘red’ (krasnye). Deemed by the bylina to be the ‘oldest and wisest of the Bogatyrs, folklore reveals Iliya as a crestfallen man who spent his first 33 years of life as a cripple, without the use of his legs. The fabled invalid is said to have been miraculously cured by the appearance of two holy pilgrims. The holy men happened by his humble house asking for water to quench their thirst. He responded to their request with regret, explaining that he was unable to walk. The holy men commanded Iliya to arise and as he did, he felt a great strength surge through his body. Now energized with heroic vigor, he set off for Kiev to serve the reigning Duke, Vladimir. Scholars have found the name ‘Iliya Murometz’ in historical documents and associated historic sites. In the 16th century, the German emperor sent his diplomat Erikh Lyasota on a mission to the Zaporozhian Cossacks. En route, Lyasota passed through Kiev and was shown the famous Cathedral of Sophia Kievskaya. It was in this cathedral he saw a Bogatyr side-chapel containing the tomb of Iliya Murometz. Aliosha Popovich sits astride his chestnut charger on the far right. While the artist was visiting his patron, Savva Mamontov’s artist’s retreat at Abramtsevo, he found models in his host’s son, as well as in a local chestnut horse, Fox. Given the epithet, ‘The Parson’s Son’ by some sources, this young knight, nonetheless, is said to have persuaded the wife of the third Bogatyr, Dobrinya, to marry him in the wake of the latter’s six-year absence. In true fable form (recalling the long delayed return of Odysseus to Penelope), Dobrinya then reappears at the wedding disguised as a minstrel, to reclaim his wife. Tradition alleges Aliosha won his battles through youthful cunning and courage, and legend aptly heralds him as a lyrical romanticist. Vasnetsov’s symbolic depiction of these Legendary Heroes from Russia’s foundations joined similar themes by such artists as Ivan Bilibin to popularize the myth and folktale preserved in the Russian/Primary Chronicles or Tale of Bygone Years. This often referenced source is a history of Kievan Rus from about 850 to 1110, originally accumulated in Kiev about 1113. The work is considered to be a fundamental source in the interpretation of the history of the Eastern Slavs compiled by one Nestor the Chronicler. Folktales, by their very nature, are embedded with myth and symbol and proved a stimulating Muse for the artist. With reference to Vasnetsov’s work on the alluring Fabergé box in this discussion, allow me to conclude with an applicable reference to the Russian Folktale of Vasalisa: In the course of accomplishing the series of tasks set forth by Baba Yaga, Vasalisa asks the Grandmother about three horsemen she sees. Baba Yaga explains the white horse is her Day, the red horse is her Rising Sun, and the black horse is her Night. In myth and folklore, these are the ancient colors connoting birth, life, and death. 1Chlenov, A. “The Bogatyrs” (Reality Article by a Member Geographical Society, SSSR [sic]”, Newspaper, Kharkov, Ukraine, no date. My name is Simon Giannini and I am by birth a French-speaking Swiss from Lausanne. As the centenary of Fabergé’s death approaches I am just two years into my career with Wartski’s in London. Every day is spent handling works of art by Fabergé and it was the close proximity to these refined and beautiful objects which first inspired me to see what traces of Fabergé’s were to be found in my home town. 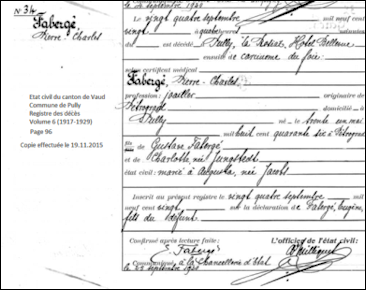 I applied for any relevant documentation on Carl Fabergé’s life in Lausanne and found his death certificate which confirmed the details supplied by Bainbridge. Namely Fabergé died on September 24, 1920. Bainbridge’s account is very poignant. He tells us Fabergé rallied just before the end. He read the newspaper and smoked one-half of a cigarette 30 minutes before his final breath. Beyond what we know from Bainbridge about this melancholy scene the death certificate states poor old Fabergé died of liver cancer in Pully “La Rosiaz” Hotel Bellevue. This much was new and I am pleased to add something to the details of the famous goldsmith’s life and even death but there was more. Fabergé‘s retreat from Russia in 1918 was depressing and ultimately exhausting. Travelling from Riga to Berlin after the Bolsheviks attack, the third consecutive city he went to was Frankfurt-am-Main, then Homburg and Wiesbaden where he spent his 74th birthday with friends. It was there depression and physical exhaustion caught up with him and he fell ill. His wife Augusta brought Carl and their son Eugène to Lausanne where she was already established. 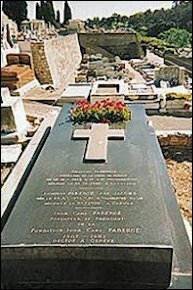 Five years later in 1925 his wife Augusta died at Cannes in France and understandably the family was keen to unite the remains of their parents. 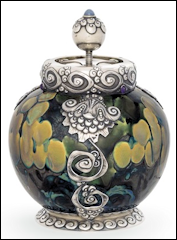 Eugène Fabergé successfully applied to the authorities in Lausanne to allow an exhumation and it was granted not just for the ashes but the cinerary urn and its box. This information comes from Eugene Fabergé’s request to the “Service des Inhumations de Lausanne”. As it was in life, so it was in death. 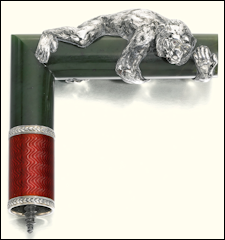 Part of the fascination with Fabergé’s creations is his lapidary work. Carl Fabergé asked he be commemorated with massive slabs of Swedish black porphyry, the lettering heightened in pure gold. Henry C. Bainbridge mentions in his 1949 biography, Peter Carl Fabergé: Goldsmith and Jeweller to the Russian Imperial Court and the Principal Crowned Heads of Europe, the jeweler celebrated his 74th birthday on May 30, 1920, with ‘15 of his old Petersburg friends’. 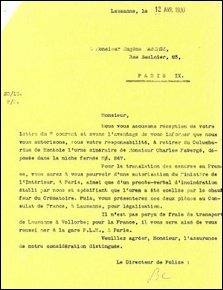 I found documents in Wiesbaden, which prove Fabergé celebrated this birthday in “Hotel Imperial” in Wiesbaden, Sonnenberger Street Nr. 16 /Corner Leberberg, while seeking a cure in the spas. 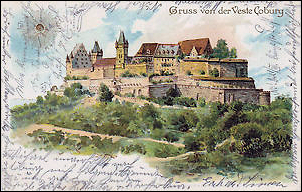 In the guest-lists of the “World-Spa-Town Wiesbaden”, dated May 29 – June 2, 1920, individuals are listed who arrived on this weekend in Wiesbaden to visit the aging and already ill Carl Fabergé. His wife Augusta came from Lausanne, one of his sons, mentioned as “Mr. Fabergé from Petersburg” (probably Eugène or Agathon) and others from Russia are on the list. 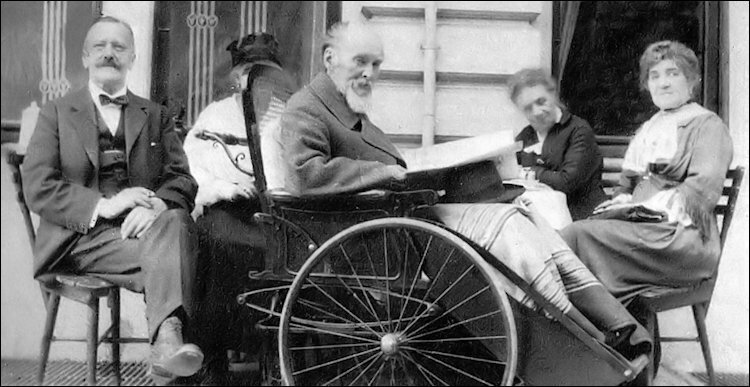 Géza von Habsburg published a photo of Fabergé sitting in a wheelchair on a terrace in front of a house after his arrival in 1918 as an emigré in Wiesbaden. An article about my findings was published in the Wiesbadener Kurier, May 28, 2016, 25. In October 2016, I will be attending the Fabergé Symposium in St. Petersburg to learn more him, and it is my hope to have a Fabergé exhibition in the Wiesbadener “Kurhaus”, perhaps 2018 (100 years after end of World War I) or in 2020 (100 years after Fabergé’s death). Great Imperial Chain of St. Andrews Order Plate IX. at Hillwood Estate, Museum and Gardens, Washington, DC. 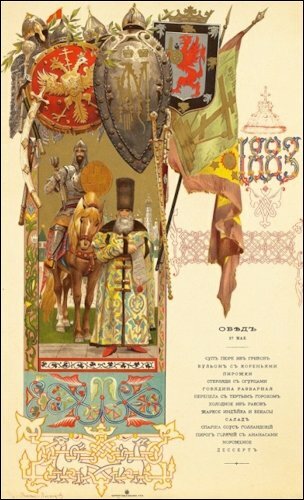 This four-part set under the leadership of Alexander Fersman is one of a small number of surviving catalogs promoting the 1926 sale of Russia’s crown jewels to foreigners. On our journey we encountered several intertwining and complicated themes … we are sharing a few of the circumstances of why and how a part of the crown jewels were sold in Moscow. 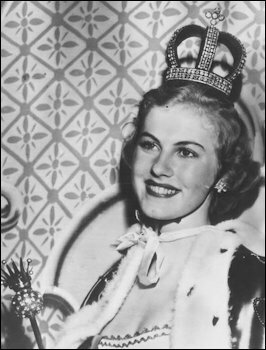 We will introduce personalities involved with the sale and the Nuptial Crown now on view in Washington (DC). FRN, Winter 2010-11 Responses from alert readers were published. 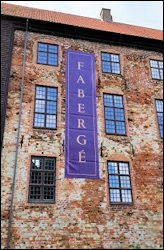 FRN, Spring 2012 Second in-depth article, Fersman Portfolio – Fabergé Jewels Reviewed by the original authors. Later that year, the authors were contacted by Jenna Nolt, librarian at the Unites States Geological Survey (USGS in Reston, Virginia), about the discovery of an album with a hand-designed cover containing photographs relating to the Fersman Portfolio. 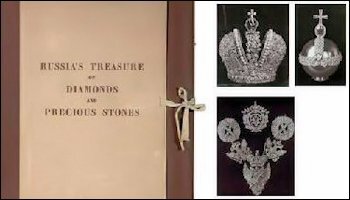 A press release and a public radio story on the newly-discovered album entitled Russian Diamond Fund (dated 1922) with additional links about the discovery tell the story. FRN, Spring 2013. FRN, Readers Forum, Winter 2015 Will Lowes from Australia and Erik Schoonhoven from the Netherlands touched on the topic again. August 1, 2016 Rose Tozer in her email advises the GIA Library has now available a digital copy of the Fersman Portfolio in English. The library houses perhaps the world’s most comprehensive collection documenting the history, science, business, and art of gems and jewelry. This online collection from the Richard T. Liddicoat Gemological Library and Information Center presents some of the most unique and rare books in the library’s collection. GIA is a nonprofit institute dedicated to research and education in gemology and jewelry arts. But the story continues with an additional discovery through the vigilance of astute readers. This time it relates to the Nuptial Crown mentioned in the first paragraph of this review. 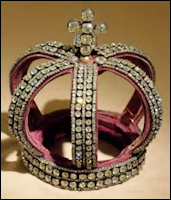 The crown made in 1848 worn by many Russian Imperial brides, is shown in the Fersman Portfolio as Plate XXVI, sold in London at Christie’s, March 16, 1927, Lot 62 for £6,100 and is today a proud possession of the Hillwood Museum in Washington (DC). FRN, Fall 2010 details the history of the crown. 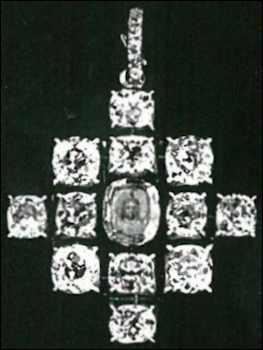 The collage of the Imperial Russian crown worn by Romanov brides from 1866-1908 is amended thanks to the detective work of Dr. Ulla Tillander-Godenhielm, scholar and author (Finland) and Timothy Adams, independent researcher (USA). 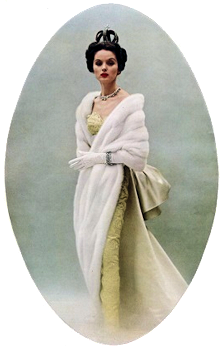 A photo from a Cartier advertisement for 1953. At press time, two new links were shared by Annemiek Wintraecken from the Netherlands, who has been fascinated with this tiara over the years. The Miss Universe Crown, Through the Years, and a Cartier advertisement. October 6-8, 2016 Fabergé Museum, St. Petersburg, Russia, is hosting an International Academic Conference Dedicated to the 170th Anniversary of the Birth of Carl Fabergé. The Vekselberg Collection encompassing 1000 objects is on view in the beautifully restored Shuvalov Palace. More than 50 Fabergé objects, many of them with Imperial provenances, will be displayed in the context of their personal story or role in the life of society at that time. An exhibition catalog is to be published. Mark Moehrke, Project Consultant and Editor, and Marilyn Sweezey, Guest Curator. October 22, 2016 The Virginia Museum of Fine Arts’ renowned Fabergé collection is returning from an international tour, and will be displayed in a new suite of renovated galleries featuring 280 objects – composed of Fabergé and other Russian decorative arts – in a multi-layered interactive experience. VMFA will be the only American art museum with five galleries dedicated to Fabergé and other Russian objects. Extended! Closing on October 29, 2016 Fabergé in the Great War shown as a temporary venue in the Fabergé Rooms of the General Staff Building, Hermitage Museum, St. Petersburg, Russia. November 3-4, 2016 Symposium entitled The Wonder of Fabergé: A Study of the McFerrin Collection will be held at the Houston Museum of Natural Science, Texas. Fabergé enthusiasts are invited to attend! November 13, 2016 Wilfried Zeisler, Curator of Russian and 19th century Art at Hillwood Estate, Museum and Gardens, Washington (DC) presents a talk, Fabergé: The Path of a Brilliant Jeweler, at the Virginia Museum of Fine Arts, in Richmond. Objects collected by Henry Walters (1848-1931), art collector and founder of the museum, gifts from the Jean M. Ridell Collection, and a necklace from a private collection will be showcased. The 1901 Gatchina Palace and the 1907 Rose Trellis eggs by Fabergé will be shown. A scholarly catalog is planned. In April 2016 members of the Hillwood Estate, Museum, and Gardens in Washington (DC) traveled to Texas to view the Artie and Dorothy McFerrin Fabergé Collection. Mrs. McFerrin and her daughter, Jennifer McFerrin Bohner, welcomed our group and gave us a tour of the collection housed at the Houston Museum of Natural Science. 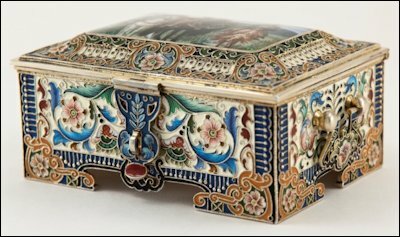 They shared a new acquisition, an enameled cloisonné casket (A.) made by Feodor Rückert, a Moscow workmaster who worked for Fabergé and also supplied objects to the firm from 1887-1917. 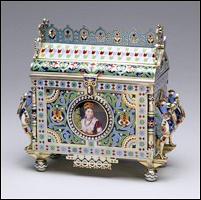 What made this particular object especially exciting for the Hillwood visitors is the enameled en plein image depicted on the top of the McFerrin casket modeled after a major oil painting in the Hillwood collection. The Boyar Wedding Feast (B.) was the subject of a recent exhibition at our museum – Konstantin Makovsky, The Tsar’s Painter in America and Paris – under the leadership of Dr. Wilfried Zeisler, Curator of Russian and 19th Century Art. The coronation of Emperor Alexander III in 1883 resulted in renewed engagement with Russia’s national history including a fascination with the settings, characters, and customs of the boyars, the Russian elite of the 1600s. Because so much was known about boyar wedding traditions, Konstantin Makovsky (1839-1915) chose to focus on this aspect of boyar life for his masterpiece. 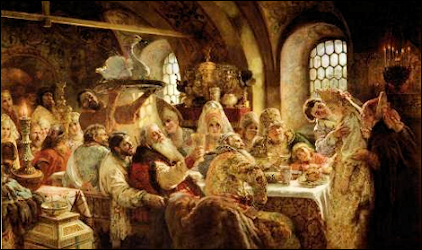 The Boyar Wedding Feast was originally staged as a tableau vivant in which the feast was staged live for an audience in the Makovsky home. The artist later recorded this event on canvas. The painting highlights a pivotal moment in the feast when the stuffed swan – symbol of beauty and fertility – is presented to the wedding couple shortly before they leave to consummate the marriage. An older male guest is shown toasting the bride and groom. In Russian tradition, he declares the wine has turned bitter asking them to kiss to make it sweet again. One sees a very reluctant young bride. She and the groom may never have seen each other before the betrothal because marriage in the 1600s was about economics and politics, not love. A matchmaker is pushing the bride forward to accept the kiss. The scene is rich with embroidered costumes, an array of authentic boyar antiques and the faces of some of Makovsky’s friends, relatives, and clients. Dr. Zeisler states, “Though less widely recognized today, the work of Konstantin Makovsky had tremendous influence on the art and culture of his time.” In Russia many objects were made depicting the painting and/or partial details from it. The casket in the McFerrin Collection, which we had the unbelievable privilege of admiring up-close without the confines of a museum display case, is an incredible example of craftsmanship from the Rückert studio. 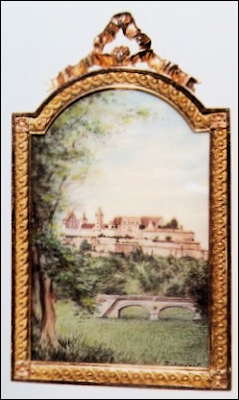 The Marjorie Merriweather Post Collection at Hillwood has other important examples of this style, i.e., a kovsh (C.) with a painted enamel miniature by Rückert depicting the bride and groom from the wedding. The Boyar Wedding Feast never entered a Russian collection. Attempts to sell the painting in St. Petersburg, Paris and London were unsuccessful. After the oil painting won the Medal of Honor at the Antwerp Universal Exhibition in 1885 it was purchased by Charles Schumann, an American who owned a jewelry store in New York City and induced Makovsky to come to America where eventually he and his painting became famous. We wish to thank the McFerrin’s for their generosity and hospitality during our visit. 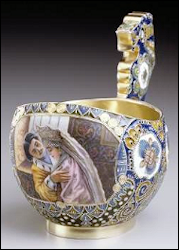 Dr. Zeisler will be one of the presenters at the Fabergé Symposium in Houston, Texas, on November 3-4, 2016, discussing in more detail art objects of this genre in his talk, “From Canvas to Silver: Enameled and Repoussé ‘Paintings’ in Russian Jewelry at the Turn of the 20th Century”. 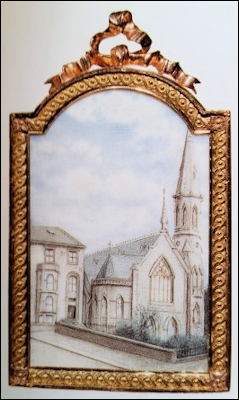 A catalog published for the Hillwood exhibition, Zeisler, Wilfried, et al. Konstantin Makovsky: The Tsar’s Painter in America and Paris is available in the museum shop and for autographing at the McFerrin Fabergé symposium in Houston, Texas. The well-known Lillian Thomas Pratt Collection of Fabergé and Russian Decorative Arts bequeathed to the Virginia Museum of Fine Arts (VMFA) in 1947 has since October 2012 traveled to the following cities in the United States: Detroit (Michigan), Salem (Massachusetts), Montréal (Canada), Las Vegas (Nevada), and Oklahoma City. 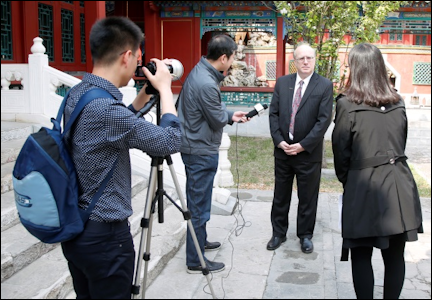 The traveling venue’s final stop – an international tour – from April-July of 2016 was at the Palace Museum in Beijing, China. Late in October 2016, five redesigned galleries with just under 2000 sq. ft. will be unveiled in Richmond, Virginia, complete with interactive components. The Richmond Times Dispatch, July 12, 2016, announced the exciting news that 280 Fabergé and Russian objets d’art will be shown. Five Imperial Fabergé Easter Eggs will be on view “in the round”. In April 2016, a group of representatives from the (VMFA), including Director Alex Nyerges, Deputy Director for Art and Education and Chief Curator Dr. Michael Taylor, and I attended the opening of the exhibition Fabergé Revealed at the Palace Museum. 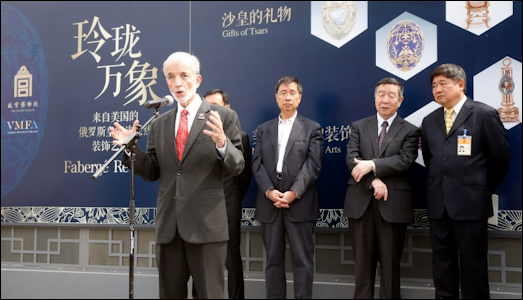 We were thrilled to be witnesses to this historic occasion since the Beijing event signaled the first time a U.S. exhibition was displayed at the Palace Museum after a culmination of a seven-year partnership between the two museums. The Palace Museum shared its own treasures at VMFA during the Forbidden City: Imperial Treasures from the Palace Museum exhibition in 2014. The official opening of the Fabergé exhibition in Beijing began with a visit to the Garden of the Palace of Established Happiness within the Forbidden City. It was my privilege to lead a tour of the exhibition after the ribbon-cutting ceremony. The Fabergé collection was beautifully displayed in the exhibit hall also in the Forbidden City, and we were thrilled to see our Fabergé objects on view in China. Three major TV stations aired stories about the venue. In the afternoon, the VMFA Member Travel group, which was touring China at the time, met with the VMFA and Chinese representatives, and then visited the Hall of Clocks and Watches, which houses a collection of Qing Dynasty timepieces, the Emperor Dowagers’ residential area of the Hall of Longevity and Wellness, and the Garden of the Palace of Compassion and Tranquility. A catalogue in Chinese of the Fabergé exhibition was produced by the Palace Museum. The staff and docents at the Virginia Museum of Fine Arts are eager to share our new and exciting exhibit beginning on October 22, 2016, with visitors to our museum. The Virginia Museum of Fine Arts is pleased to announce the digitization of the Pratt archive, which is held by the VMFA Archives. The project was made possible through a Foundations Planning Grant from the National Endowment for the Humanities. The archive documents the formation of Pratt’s remarkable collection of more than 400 Russian objects, including five Imperial Easter Eggs and approximately 170 additional works from the House of Fabergé. Bequeathed to the museum upon her death in 1947, Pratt’s Fabergé collection consistently remains one of the highlights of the museum’s permanent collection. Pratt purchased most of her Fabergé objects from the Schaffer Collection and the Hammer Galleries, both of New York City, in the 1930s and 1940s. Comprised of correspondence, invoices, price tags, and detailed item descriptions, the archive illuminates Pratt’s mind as a collector, as well as her close relationship with the dealer Alexander Schaffer. In all, 729 items have been digitized, resulting in about 1,500 new image files, all of which will be made available to the public via the museum’s website. The new online portal will launch on October 22, 2016, to coincide with the opening of the impressive new installation of Fabergé and Russian decorative arts in VMFA’s renovated permanent gallery. In addition, the VMFA has also digitized a recently acquired coronation album documenting the coronation of Tsar Alexander III and Empress Maria Feodorovna in 1883. Only seven albums were commissioned by the Russian tsars to document and promote the pomp and pageantry of their imperial coronations. VMFA’s copy is in French, as it was created for a French dignitary attending the coronation. It is beautifully illustrated with almost 30 chromo-lithograph plates and resides in the rare book collection. The digitized album will be available to the public via the museum’s website in late October. An exhibition with a working title of Fabergé and the Russian Craft Tradition planned for October 2017 at the Walters Art Museum in Baltimore, Maryland, will weave together diverse collections to illustrate the virtuosity and skill of Russian crafts people working from the 12th – 20th century. Henry Walters (1848-1931), for whom the museum is named along with his father, William, first became acquainted with the artistry of Carl Fabergé at the 1900 Paris World’s Fair, where Fabergé displayed Imperial Easter Eggs and diamond-set miniatures of the Russian Imperial regalia. That same year, Henry and his party sailed to St. Petersburg aboard his yacht Narada. He and his guests visited the House of Fabergé, where Henry bought exquisite ornamental pieces like hardstone animals and jeweled parasol handles for himself and his guests. By the late 1920s, the world had changed, and a Russian émigré antique dealer in Paris, Alexander Alexandrovich Polovtsov (1867-1944), reignited Walters’ passion for Russian works of art. With Polovstov’s guidance, Russian art treasures found a safe repository in America. Henry acquired more than 70 pieces through Polovstov, including two prized Fabergé Imperial Eggs: the 1901 Gatchina Palace and the 1907 Rose Trellis. Walters also acquired antique icons and enamels, fine porcelain, and historic silver drinking cups. These works embody 800 years of Russian form, style, and character. Influences from Byzantium, the Islamic world, and Western Europe can be detected and speak to Russia’s complex history and rich cultural heritage. Also featured is an Ovchinnikov casket gifted to the museum in memory of Jean M. Riddell, patron of the arts as well as founder and principal supporter in the early 1960’s of the National Ballet in Washington (DC). 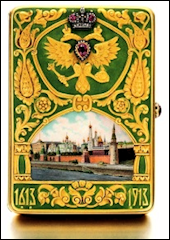 The late 19th century Moscow-made Old Russian-style enamels employ colors, motifs and forms first popularized in 17th century Russia. 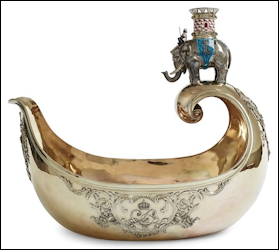 Broadly speaking, the Old Russian-style kovshi, tankards, boxes and souvenir pieces highlight the differences in taste between Moscow and St. Petersburg, where Fabergé was considered the height of fashion. The Walters Art Museum is a leading center for the study of Russian art and enamel, and Fabergé and the Russian Craft Tradition is a celebration of Russian craftsmanship through eight centuries and across multiple artistic disciplines: enamel work, silversmithing, goldsmithing porcelain production, and fine jewelry. A scholarly catalogue, published by Thames & Hudson, will accompany the exhibition. Christie’s London auction house published a promotional booklet, Russian Art featuring sale highlights over the years, including a large number of Fabergé objects. In English and Russian. 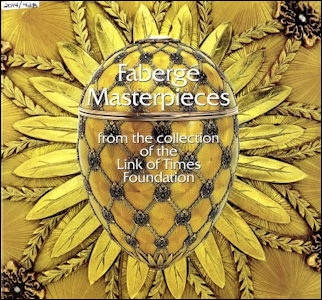 The Link of Times Historical and Cultural Foundation published Fabergé Museum in St. Petersburg, 2015. A general introduction to the museum’s contents includes the historical background to the collection, and stunning photographs of the various categories – Imperial Easter eggs, commemorative items from the Romanov family and the Cabinet gifts, famous customers, Russian enamel and silver, and a tour of the various exhibition rooms of the Shuvalov Place in St. Petersburg. Copies of this publication (above left) are available for purchase from the Museum Shop at the Hillwood Museum in Washington (DC). Muntyan, Tatyana, with V.S. 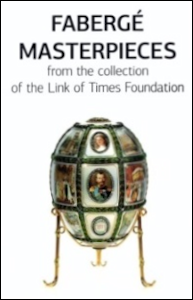 Voronchenko, general editor, Fabergé Masterpieces from the Collection of the Link of Times Collection (2014 and reprinted in 2016 with a new cover, above middle and right) The history for each of the Fabergé eggs in the collection is presented in detail. The catalog, Fabergé – Tsar’s Court Jeweler and His Association to the Danish Royal Family for the Koldinghus Museum exhibition is very well done for this charming and very personal collection of 100 hundred loans from members of the Danish royal family, who through family ties to the Russian emperor and his family inherited these pieces. Many of the objects have very rarely been on public view, since they are still used by the royal family. They are displayed in a state-of-the art installation in a wing of a restored 13th century medieval castle heavily damaged during an 1808 fire. Adding to our enjoyment – Ulla Tillander-Godenhielm, Christel and George McCanless – was an informative tour by Thomas C. Thulstrup, Museum Director, who told us it took three years to work out the myriad details involved in such an undertaking. Muntian, Tatiana. Feodor Rückert and Carl Fabergé (2016) published in Moscow. The lavishly illustrated tome presents in 702 pages the Maxim Revyakin Collection in Moscow. Text in Russian and English. NEW! 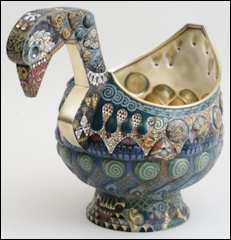 Available at the Houston Fabergé Symposium, The McFerrin Collection, The Opulence Continues by Dorothy McFerrin. Catalog of 300 new objects added to the McFerrin Collection since the publication of the previous book about the collection, From a Snowflake to an Iceberg: The McFerrin Collection in 2013. Mieks Fabergé Eggs website hosted by Annemiek Wintraecken has an updated listing of YouTube egg videos organized by museums, old black and white Pathé and British Movietone newsreels, and documentaries. – Fauxbergés: The Master Forgers Excellent visual introduction by the scholar who coined the word “Fauxbergé”. Skurlov, Valentin, Fabergé, Tatiana, et al. Franz Birbaum, Fabergé’s Chief Designer (2016). Publication continues the series, Life of Remarkable Jewelers begun in 2011 with the first book, Mikhail Perkhin, Chief Workmaster of Fabergé. Birbaum (1872-1947), born in Switzerland, arrived in St. Petersburg at age 14, and eventually worked as an chief designer for the Fabergé firm from 1893 to 1918. Most of the 50 Imperial Easter eggs passed through his hands. Book highlights include almost all known publications about Birbaum, 12 letters from the archives of Tatiana Fabergé written between 1922-1939 by Birbaum and Carl Fabergé’s first son, Eugène, three articles by Birbaum devoted to art history published in Russian magazines 100 years ago, etc. In the words of the authors, the documents characterize Birbaum “as a miniature painter (as he named himself), master – enameller, technologist, gemologist, art historian, organizer of production and public man …” The monograph includes a chapter suggesting a missing Fabergé egg has been found. The debate continues among Fabergé scholars, if the egg in question is indeed the lost 1902 Empire Nephrite Egg. In Russian. Fabergé, Tatiana, Skurlov, Valentin, et al. Crimea and Fabergé (2016). Profusely illustrated booklet with well-known Fabergé objects combined with photographs of the original owners presented in a variety of topics, for example, “Romanovs and the Crimea, Products of Fabergé, 1914-1917”, pp. 22-23. In Russian. The redesigned website of the London Fabergé dealer Wartski includes the text of an article by Geoffrey Munn, Fabergé and Japan (Antique Collector, January 1987, 37-45). It discusses the significant influence of Japanese works of art on the animal studies created by Carl Fabergé, an avid collector of Japanese netsuke. Dr. Markus Miller, director of the Museum Schloss Fasanerie, in connection with his research for the exhibition Fabergé, Gifts from the Tsar’s Family on view in Eichenzell, Germany, shared new information with the curatorial department at the Virginia Museum of Fine Arts. One more unsolved puzzle remains. The venue depicts the connection of the Russian Imperial family to their German relatives through the children of Grand Duke Ludwig IV of Hesse and by the Rhine and his wife Alice, born a princess of Great Britain. For Easter 1896, Emperor Nicholas II presented to his wife Empress Alexandra Feodorovna a rock crystal egg (Egg with Revolving Miniatures) containing a surprise of 12 revolving gold frames with miniatures of places dear to the Empress from her youth as the daughter of Louis IV Grand Duke of Hesse and Alice. Recent studies have shown Fabergé’s designers drew from diverse sources – Dresden’s Green Vaults, 18th century French boxes, and Renaissance jewels – for their inspirations. Portrait diamonds were of enormous importance to the firm’s creations for the Imperial family, in particular for the Imperial Easter eggs. A portrait diamond is a slightly confusing term; it designates a portrait miniature covered by an unusual sort of flat diamond. 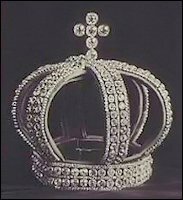 I hope to demonstrate in a forthcoming article that portrait diamonds were exchanged within the Imperial family as a form of sentimental jewelry. 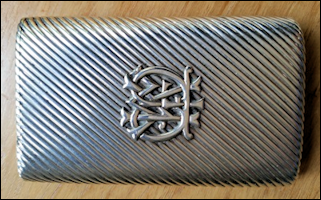 Reader is looking for a Fabergé cigarette case similar in design and with a push piece on the upper right matching a cigarette case by Gabriel Niukkanen presented to Lord Suffield in 1901. The case in question would have been presented with an inscription to Dr. J.M. Atkinson, 1904. Has the Atkinson case been at auction, or are its whereabouts known? 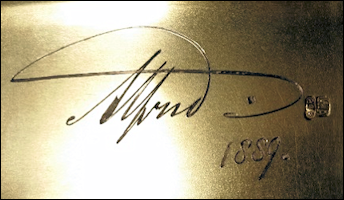 Can anyone identify the monogram or the signature of Alfred in this Cyril (Karl) Albrecht cigarette case?